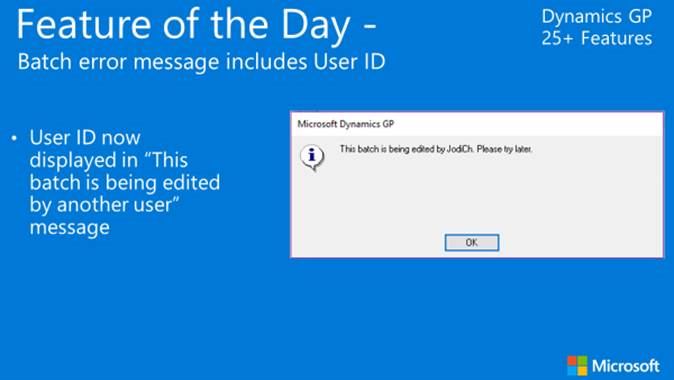 Last week, we highlighted ten new features in Microsoft Dynamics GP 2016 R2, and today, we will highlight nine more features demonstrated in Microsoft’s Feature of the Day series. Again, GP 2016 R2 is following the GP Roadmap shared below. 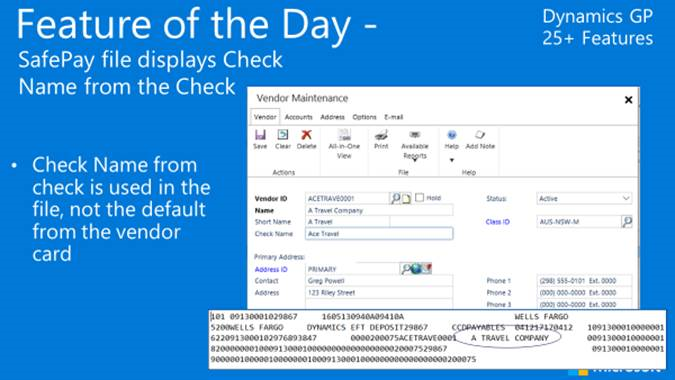 The first announcement from the GP community blog, a major change for users in GP 2016 R2 is that there is a new process for reconciled transaction maintenance in routines. 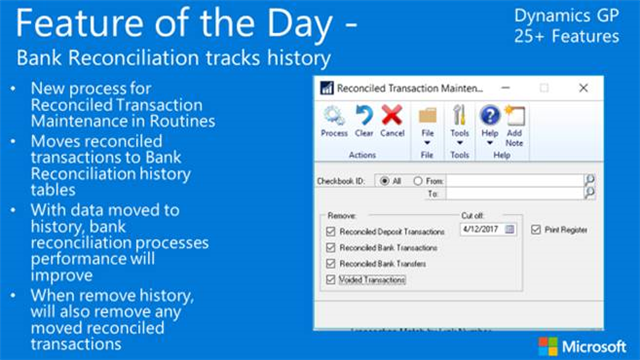 This improves bank reconciliation performance and when users remove history, the software will now remove reconciled transactions. 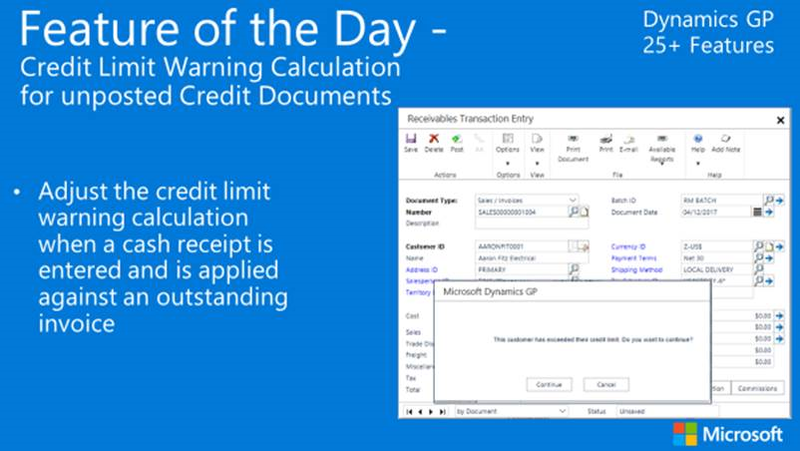 A big update from GP, users can now adjust the credit limit warning calculation when a cash receipt is entered and applied against an outstanding invoice. Improving on visibility and security, the name from the check will now be used in the SafePay file as opposed to defaulting from the vendor card. Taxes are a necessary part of life. 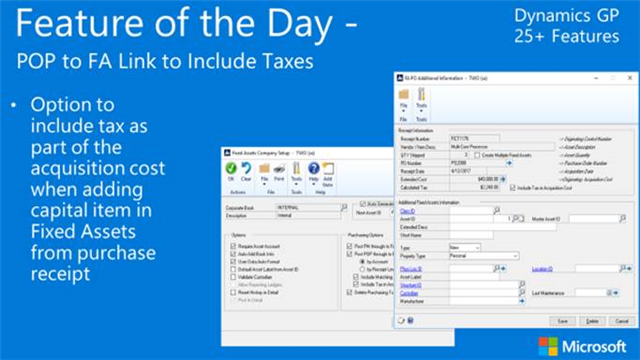 New in GP 2016 R2, users can now include taxes as part of the acquisition cost in the Fixed Assets module. Simply put, a user can take the tax from the purchase receipt and include it with the capital item. 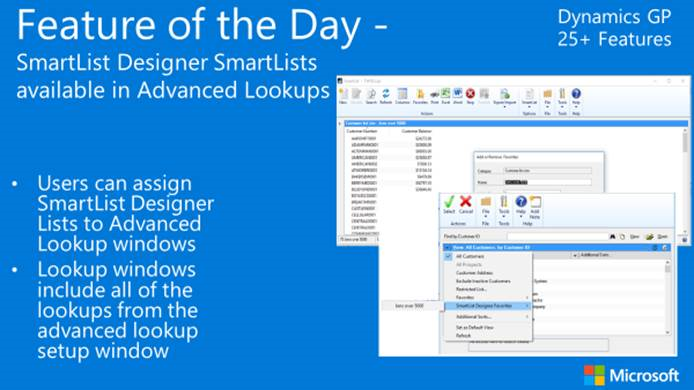 Announced on November 2, 2016, the ability to assign SmartList Designer Lists to Advanced Lookup windows will help users make the most of Dynamics GP. If you’ve ever had to deal with the “This batch is being edited by another user,” message, you’d hope to be able to know who’s editing said batch. This new feature will ID the user editing the batch. For those of you who love SmartLists and have SmartList favorites, this feature is for you. Now other users won’t change them. 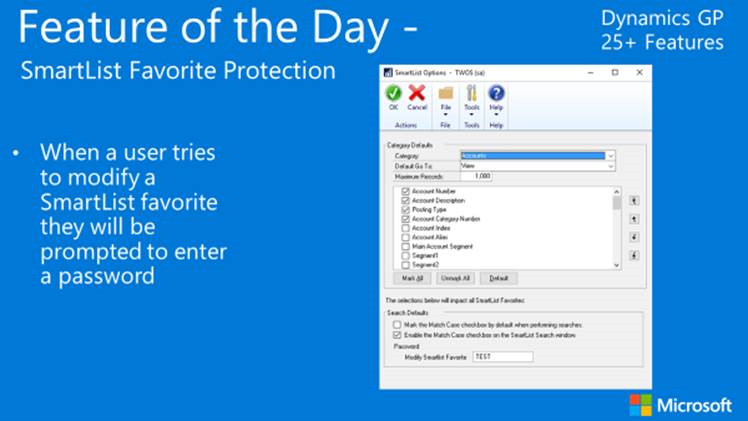 Users will now be able to password-protect SmartList favorites from editing. 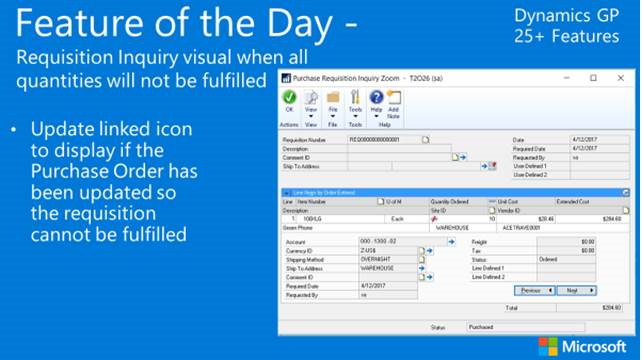 Helpful for many users, an important Feature of the Day update is the ability to Cancel a Purchase Order when it’s linked to a Requisition. 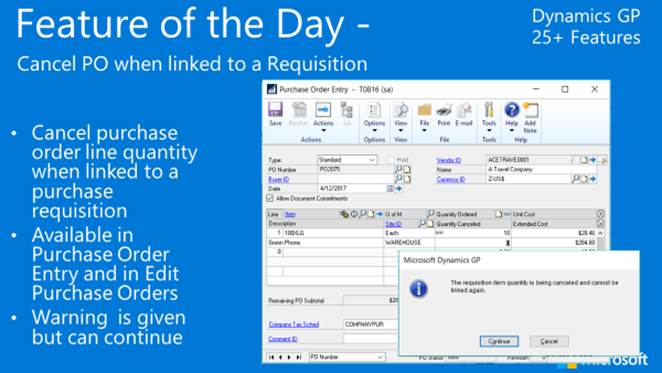 The 19th and final improvement to Dynamics GP 2016 R2 that we will be talking about today is that a visual will appear in requisition inquiry when all quantities will not be fulfilled. Wipfli/Brittenford has helped organizations leverage the familiar and feature-rich Microsoft Dynamics GP for decades, and we are excited to share this news about the new features. To learn more about our services for businesses using GP, click here. To see some of the work we’ve done for highly satisfied clients using Microsoft Dynamics GP, see the following case studies: ACLI Completes Dynamics GP Upgrade, Arizona Diamondbacks implement ExpenseConnect for GP.